When You Are Just Visiting Us. You can always visit our site without revealing who you are or providing any Personal Information. When you visit our site we do collect usage information, but it is anonymous and is not linked to you as an individual. We use this data to better understand things like how our site is navigated, how many visitors arrive at specific pages, the length and frequency of stays at our site, the variety of searches of our site's database, the types of browsers and computer operating systems used by our visitors and the Internet Protocol addresses from which our visitors connect to our site. We use this information to improve our site content and ease of use. We, or a third-party advertiser acting on our behalf, may place a "cookie" or "pixel tag" on your personal computer when you come to the site or visit a site on which we advertise. These devices are small computer files that our computer sends to your computer and that your computer sends back to us each time you make a request from our site. We use these devices to collect data to help us personalize and improve your experiences on our site. The data on your use of our site may be linked to the Personal Information you have chosen to share with us when you register. Most Internet browsers automatically accept cookies. However, you can instruct your browser, by editing its options, to stop accepting cookies or prompt you before accepting a cookie from the sites you visit. If you decide not to accept our cookies, your ability to use some features on our site may be impaired. In addition, we occasionally use the services of a marketing company to help us measure the effectiveness of our advertising and how visitors use our site. To do this, we use pixel tags and cookies provided by our marketing company on this site. The information we collect helps us learn things like what kinds of customers our site attracts, which of our products most interest our customers, and what kinds of offers our customers like to see. Although our marketing company logs the information coming from our site on our behalf, we control how that data may and may not be used. When You Decide To Register With Us. If you decide to register with us, we will collect Personal Information about you that you voluntarily share with us. We collect Personal Information that is necessary for us to provide you with the services offered on our site. As mentioned, this Personal Information includes things like your name, favorite destinations, email and possibly mailing address and telephone number. You will provide an email address and select a password that will be required to gain access to portions of our site. You may decide to share other information with us about yourself (for example, demographic information like your age and gender) and your travel preferences and experiences (for example, seat selection, participation in airline/hotel/car rental loyalty or awards programs and applicable membership numbers, meal requests and ticketing options). If you share this information with us, we will use it to automatically record your travel preferences in reservations you make, tailor your experience at our site to your interests and make more appropriate travel recommendations to you. You may still use our site to search for and purchase travel services even if you choose not to share this type of information with us. We combine your Personal Information and other information you voluntarily share with us in what we call your "Traveler Profile". We also add the data about how you use our site to your Traveler Profile. We may also collect information about you from outside sources and add it to your Traveler Profile. We collect and use all of the information in your Traveler Profile to improve the quality of our service to you and your experience with us. For example, we may use the combination of information in your Traveler Profile to (a) personalize the service we provide to you, (b) communicate with you about changes to your travel plans, service updates and new features or outages on our site, and (c) allocate the resources of our systems so that your experience with our site is as efficient as possible. As part of the registration process, we give you two important choices ("opt-out") about receiving advertisements, updates and promotions via email. We hope you will find these items interesting and informative. In fact, we will use the information you tell us about your travel preferences and experiences to share customized advertisements, updates and promotions with you that include our recommendations to you about travel specials. Nonetheless, you will let us know if you do not want us to use your email addresses to deliver to you: (1) our information updates highlighting flight specials, promotions, contests, sweepstakes and other travel opportunities available on our site and/or sponsored by our travel service providers and advertisers; and/or (2) our newsletter highlighting flight specials, promotions, contests, sweepstakes and other travel opportunities available on our site and/or sponsored by our travel service providers. We use an email delivery and marketing company to send the emails that you have agreed to receive. Pixel tags and cookies are used in those email messages and at our website to help us measure the effectiveness of our advertising and to study how visitors use our site. For more information about how to set your browser to reject cookies, please read the documentation of your browser. Of course, if you do not opt-out of receiving our emails during registration, but later change your mind, you can always choose to opt-out by following the link at the end of the mail that is sent to you. We value your comments and opinions. From time to time, we will invite you, as a registered user of our site, to participate in online competitions or prize draws, but the choice will be yours. We may offer you the chance to win a variety of travel related prizes by sponsoring contests. You choose to participate in these contests or not. If you choose to participate in these contests, you will share certain of your Personal Information with us, like your full name, email address and mailing address. Participation in these contests may include participation in an online survey. We will only use your Personal Information to notify you if you win a contest. When You Purchase, Book Or Reserve Travel Services or Accommodations Through Our Site. If you register with us, you will be able to book, reserve or purchase travel services or accommodations through our site. To do so, you must provide payment information to us - for example, your credit card specifics like card number, expiration date, cardholder name and billing address. We may add this payment information to your Customer Profile. We will keep a history of all your reservations, bookings and purchases of travel services and accommodations through our site in your Customer Profile, unless you choose to edit your Customer Profile as described below in this policy (Changing and Removing Personal Information and Other Information). Generally, we only disclose your Personal Information to those travel providers that you decide to make arrangements with through our site. For example, when you purchase an airline ticket or reserve a rental car or hotel room, we will provide the airline, car rental agency or hotel, as the case may be, with the Personal Information needed to process your transaction. We use our reasonable efforts to ensure that these travel providers will also protect your Personal Information. We contract with other companies to perform various functions necessary to operate our business - for example, to deliver tickets, ship items and process credit cards. We will share with these other companies only that Personal Information they require to fulfill your orders. These companies agree that they will not use or disclose that Personal Information for any other purpose. Other than as explained in this policy, we will not disclose any Personal Information we collect from you to others without your permission, except in certain limited circumstances: (a) to protect the security of our site and our rights under our Terms and Conditions of Use; (b) to protect ourselves against liability; (c) in response to legal process, (d) if we believe in good faith that the law requires it; or (e) in connection with a sale of our business or company. If you, or someone acting on your behalf, purchase(s) travel services or accommodations through our site and (a) you, or someone acting on your behalf, tell(s) us that your purchase is for corporate travel purposes either by (i) indicating in the booking path that the purchase is for corporate travel or (ii) indicating that the credit card being used is a corporate credit card and (b) we have entered into an agreement with your corporation to provide data on the purchase of travel services or accommodations by the corporation's personnel, we will provide your corporation with the Personal Information necessary for the corporation to track your corporate travel purchased on our site. If you decide to book, reserve or purchase travel services or accommodations for other travelers using your Traveler Profile, we will collect certain Personal Information about these other travelers. You will need to make sure that each of these other travelers agrees, in advance, that you can disclose their Personal Information to us. We will retain these other travelers' Personal Information in your Customer Profile. Changing and Removing Personal Information and Other Information. We are committed to giving you control over your Personal Information. You can change your password and any of the Personal Information or Other Information in your Traveler Profile, by sending an email to our Customer Services department. If at any time you want to view the Personal Information or Other Information in your Traveler Profile, your Personal Information changes, you want to change the preferences associated with your account, or would like us to remove some or all of the Personal Information or Other Information stored in your Customer Profile, you can notify us by sending an email to our Customer Services department. If you request that we remove all of the Personal Information and Other Information stored in your Customer Profile, then we will promptly do so. If we remove your Personal Information you will not be able to use the services available on our site unless you re-register. Similarly, we will remove all of your travel records within six (6) months after receiving a request to do so. This six (6) month period is necessary to ensure that travel arrangements made through our site are properly accounted for. We may not be able to honor your request to remove your Personal Information or travel records if we are legally obligated to retain that information or those records. You will not have the ability to view, change or remove session data or information that we have gathered from third parties from your Customer Profile. We may change this policy from time to time. If we decide to change this policy in a material way (for example, a change regarding disclosure of Personal Information), we will post notice of the change on our site and notify you via email at the address you have provided to us or pop-up screen at least thirty (30) days before putting the change into effect. If we decide to change our policy in a less significant way, we will simply post notice of the change on our site at least thirty (30) days before putting the change into effect. If any proposed change is unacceptable to you, you may, as discussed in the section above (Changing and Removing Personal and Other Information), request that we remove your Personal Information from our records. We may also combine anonymous information supplied by you and other users during registration on our site with information about your use and others' use of our site. We will use this combined information to describe our user base, without reference to any specific individual, to potential partners, investors and advertisers. We will not share your Personal Information with any other users of our site, but we may use information we collect about your travel preferences and experiences to make recommendations to other users of our site. For example, if we know that you and other users of our site who have traveled to a particular destination had positive experiences at a hotel in that destination, we might recommend that hotel to others who will be traveling to that destination. We may also share aggregated statistical information about users of our site and our service and product offerings with others, including our vendors and partners. We will not link this statistical information to any Personal Information that can identify you as an individual. Children - in fact minors (individuals under 16 years of age) - are not eligible to register for or use the services available on our site. We believe that parents should play a central role in their child's online activities and should monitor those activities to ensure that sites visited by their child are respecting their child's privacy. 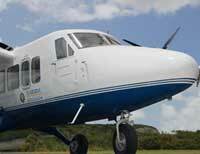 The Twin Otter is a perfect aircraft for groups of up to 19 passengers. 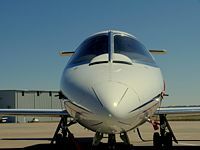 This aircraft will be ready for performing charter flights as of November 15th, 2008. We operate as a virtual airline. Meaning we don't own our own aircrafts. We represent various airlines and aircraft operators with a diversity of planes of different capacities: 7, 9 and 19 seats who operate flights and charters on our behalf, making it possible to provide you with better flexibility for whatever size your group group may be. Flying you when you want to and where you want to without hassles!!! It's just smarter to charter !!! This Lear jet is also available for medevac charter flights. Visit www.AllCaribbeanCharters.com to request a charter.